32 UCW MARCH 6-12, 2019 WWW.UPANDCOMINGWEEKLY.COM Off Peak Hours On Peak Hours May – October PM Peak Hours: 3 – 7 PM* *weekdays only Just for You … • Complimentary tote bags for the first 500 visitors • Green Giveaways, including free LED lights, tree seedlings, fat trappers and more • Kids' Korner – with fun activities that help them learn about conservation, too "Pay it Forward" by bringing a non-perishable item for Second Harvest Food Bank. Visit faypwc.com for details on our Conservation Expo, including suggested items for Food Bank donations – and more information on Time-of-Use rates. 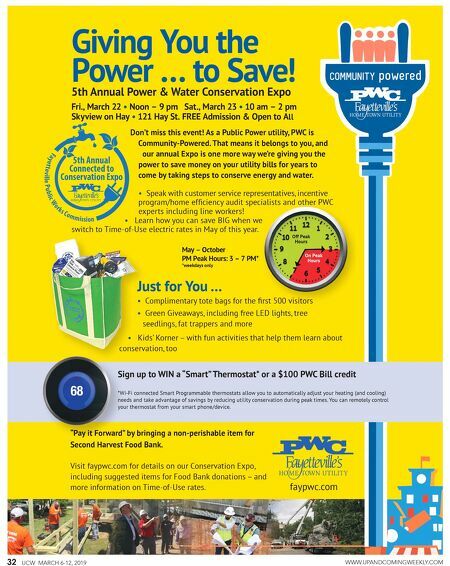 5th Annual Connected to Conservation Expo Fay et t ev ill e P u b li c W o r k s C o m m i ssi o n faypwc.com Giving You the Power … to Save! 5th Annual Power & Water Conservation Expo Fri., March 22 • Noon – 9 pm Sat., March 23 • 10 am – 2 pm Skyview on Hay • 121 Hay St. FREE Admission & Open to All Don't miss this event! As a Public Power utility, PWC is Community-Powered. That means it belongs to you, and our annual Expo is one more way we're giving you the power to save money on your utility bills for years to come by taking steps to conserve energy and water. • Speak with customer service representatives, incentive program/home efficiency audit specialists and other PWC experts including line workers! • Learn how you can save BIG when we switch to Time-of-Use electric rates in May of this year. Sign up to WIN a "Smart" Thermostat* or a $100 PWC Bill credit *Wi-Fi connected Smart Programmable thermostats allow you to automatically adjust your heating (and cooling) needs and take advantage of savings by reducing utility conservation during peak times. You can remotely control your thermostat from your smart phone/device.